The below information is excerpted from A Beginner's Guide to Baking Bread ebook by Marilyn Moll. It is also available in a spiral bound edition. I have made most all our own bread and bakery goods for the last 22 years. I will briefly outline the advantages and disadvantages of each of the electric grain mills available, from my 22 years of experience with mills. Micronizing mills are exclusively powered by electricity and utilize technology that originally was developed for the pharmaceutical industry to derive fine, uniform powders. Modified for milling grains, micronizers are fast and capable of milling grains into very fine, powdery flour at low temperatures. My personal preference and baking experience has been exclusively with micronizing grain mills. KITCHEN MILL Advantages - Large flour catch pan - holds 21-23 cups flour, strong reliability record, stores very compactly (if storage space is at a premium at your house you will appreciate this), produces high quality fine flour, mills all grains and dry beans, lifetime warranty on milling system/5 yr. warranty on the motor, mfg. in the USA. This grain mill was my first mill and my husband's favorite. Disadvantages: Smaller grain hopper, noisier than certain other mills. NUTRIMILL- Advantages - Large flour canister - holds 21 cups of flour, life-time warranty, large grain hopper, slightly quieter than K-tec but has the same milling system, slide out drawer contains flour mills most grains and dry beans. Disadvantages: higher price, takes a large amount of storage space, mfg. in Korea. Wondermill - Advantages - Formerly known as the Whisper Mill, slightly quieter than The Kitchen Mill, large hopper capacity, six year warranty, high quality flour, grain feeds well into milling mechanism, produces flour quickly. My personal favorite grain mill. New models have a larger, more reliable motor. This grain mill is my personal preference. This type of grain mill also can be operated by both hand or electric power and offers the ability to adjust the fineness of the flour from fine to cracked. Generally, the steel-cone burr will produce flour at a slower speed, but the electric version is also relatively quiet to run. Steel cone burr mills can make fine flours suitable for breads, muffins, pastries, etc, but the flour may not be as fine as stone or micronizing mills. These grain mills can also mill most whole grains and beans, but larger grains such as corn and beans will need to be cracked first, and then run through again on a fine setting if you want flour. 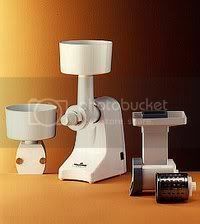 FAMILY GRAIN MILL - Advantages - versatile; available with handbase and other food processing attachments, adjustable fine to course mechanism so mill will crack grain, can be used with Bosch Universal with an adaptor or with K-Tec Kitchenetics without an adaptor, German made, quietest mill we sell, takes minimal storage space, very economical. Disadvantage - flour may not be quite as fine as Nutrimill, Wondermill or Kitchen Mill, slower production of flour than high speed mills. The above information is excerpted from A Beginner's Guide to Baking Bread by Marilyn Moll.